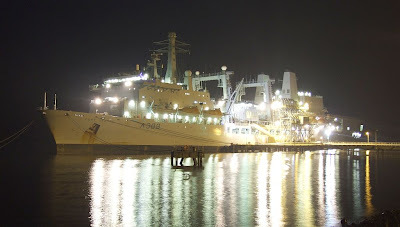 Spending Christmas and New Year alongside the NATO fuel jetty at Loch Striven is the 'one-stop' Royal Fleet Auxiliary replenishment ship FORT GEORGE. Completed in 1993 by the Swan Hunter shipyard on the River Tyne, this 204 metre long ship acts as a combined fleet support tanker and stores ship. Not only are FORT GEORGE, and her sister FORT VICTORIA, able to replenish ships steaming alongside them at sea, they can also supply fuel to another ship astern, using their 'Hudson Reel'. FORT GEORGE is capable of working with helicopters, for which she has a flight deck and large hanger facility aft. Two Crossley-Pielstick main engines give her a service speed of around 18 knots. More information about these ships can be found here. I would like to thank all visitors to this site for their support and encouragement since August, and wish you a very happy and prosperous New Year. And a Happy New Year to you too ClydeSighter and to everyone who visits here.